Whatever doesn’t kill you, makes you… slower. The New York Times recently shocked us with the gritty details of Amazon’s high-stress workplace. There are many ways the company amps up the pressure—encouraging anonymous complaints against coworkers, regularly culling the ranks, and relentlessly tracking performance. But one tactic is familiar to many American workers: long hours. “You can work long, hard, or smart, but at Amazon.com you can’t choose two out of three,” CEO Jeff Bezos told shareholders in 1997. Contrast that with the Obama administration, which recently announced a proposal to significantly increase the number of Americans who have to be paid overtime when they work more than 40 hours a week. While that will mean more money for some, it will also mean that others are sent home when they hit the 40-hour mark, which will allow them to benefit from “an equally precious gift, the gift of time,” as Labor Secretary Thomas Perez put it. Putting in weeks of overtime eventually reduces productivity, which doesn’t bounce back. By international standards, Americans put in a lot of time on the job. Among countries in the Organization for Economic Cooperation and Development, we’re above the average, clocking 1,789 hours at work in a year—more than Japan, Germany, and South Korea. Each week, the average American puts in 41 hours per week, compared to 38.4 in the United Kingdom, 36.9 in Germany, and just 32.7 in the Netherlands. We also have more workaholics: The percentage of US workers who put in more than 45 hours a week is about double that of Germany, the Netherlands, or France. While we’ve decreased our workload by 112 hours a year over the past four decades, other countries have far outpaced us: The French dropped theirs by 491 hours, the Dutch by 425 and the Canadians by 215. Even so, it doesn’t mean we’re getting a whole lot more done. The countries putting in the least time at work are generally the most productive. Greeks work about 600 more hours a year than Germans do, but German productivity is 70 percent higher. The amount of growth in the gross domestic product for each hour that Americans work has increased by 1.7 percent since 1970—less than the increases in all of the Nordic countries, where people work fewer hours. Moreover, all studies of actual workers indicate that while working more might produce an initial boost, we burn out pretty quickly and don’t recover until we take a break. One study found that those who put in 55 hours a week performed worse at cognitive functions than those who worked 40 hours. Another found that workers can achieve a small boost by putting in more than 60 hours, but that it only lasts three to four weeks and then falls off. Putting in weeks of overtime eventually reduces productivity, which doesn’t bounce back. 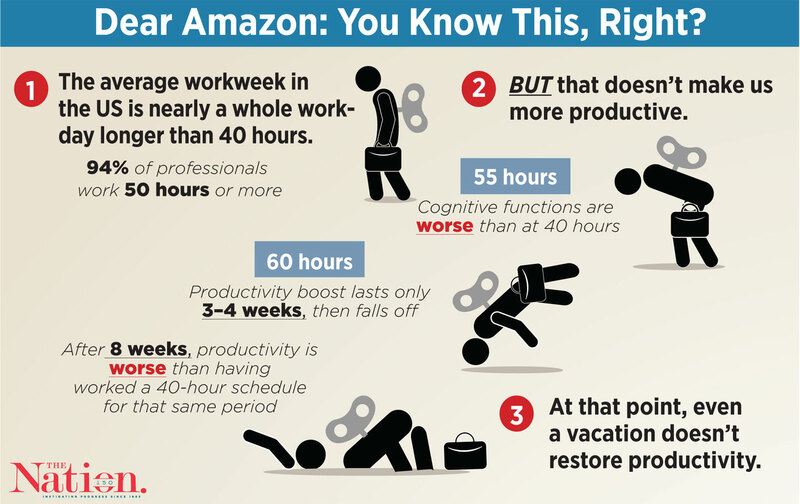 After eight 60-hour weeks, productivity is hurt so badly that it would’ve been better simply to stay with a 40-hour week the whole time. One woman who spoke anonymously about her time at Amazon described being forced to leave work by her fiancé every evening at 10 pm and doing work every day of her vacation. “That’s when the ulcer started,” she said. She no longer works there. Sadly, Americans aren’t benefiting from all that research. Our average workweek is nearly a whole workday longer than the 40-hour one that researchers say is most beneficial. Ninety-four percent of professional workers log 50 hours a week or more. There are certainly plenty of people in the United States who would like more hours at work: 6.3 million are working part time but want to be full time. Others would like more consistent hours, particularly in areas like retail, where schedules can change without warning. But the overall picture is that Americans are working incredibly hard without seeing more pay or a stronger economy.